There are many different ways of coming up with research ideas in organic synthesis. Broadly, chemists tend to be driven by either functional significance of their favorite molecules or by methods of synthesis. Some of us simply desire to reach a given target and then move on to the next one, without necessarily spending any extra time deciphering how molecules function. These are the three main types of research directions in organic synthesis. I want to talk about a very frequently encountered and, judging by the amount of papers, fertile area of inquiry: studying the effect of solvent on reactivity. I cannot say that this domain of knowledge ever attracted me, although my lab does have a list of our favourite solvents that dictate our preferences for running reactions. However, I would never seek this to be a defining feature of a research project. It just isn’t my thing. But whatever rocks your boats, ladies and gentlemen! On the subject of solvent systems, many people feel passionate about all sorts of reaction milieu. Ionic liquids, fluorous media, biphasic systems based on water/organic solvents, you name it. Some of this research is purely Edisonian, but every now and then I see papers that go into my “skeletons from the closet” folder. This file grows from year to year and occupies a segment of my computer I am almost afraid to visit. I know each of these papers documents intriguing results, but I am just not yet prepared to fully understand the corresponding rationale. 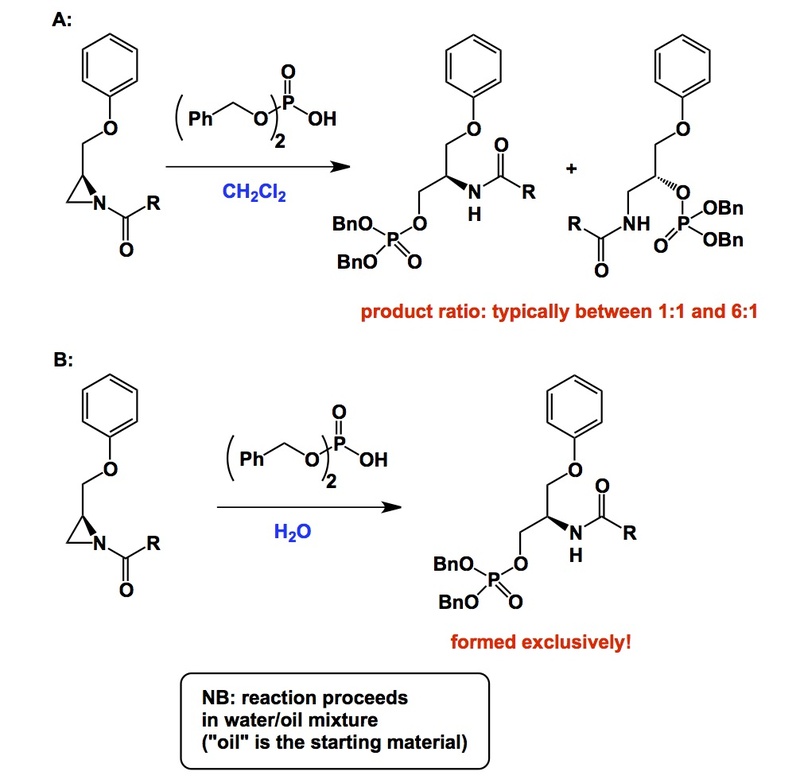 for similar reactions (epoxide opening with amines, Michael addition of amines to acrylate esters) the solvents that worked for me best were trifluoroethanol and (when the solvent cost was not an issue) hexafluoroisopropyl alcohol. In fluorinated alcohols I saw similar selectivities but faster rate than in water or MeOH, and much less problem with solvolysis. We love HFIP as well. Two issues: a. toxicity (due to hexafluoroacetone) and b. cost (as you point out). Otherwise – lovely stuff. It can be cheaper if purchased in bulk from China… We got 20 liters TFE from there. Thanks a lot, good to know – I will tell my students!